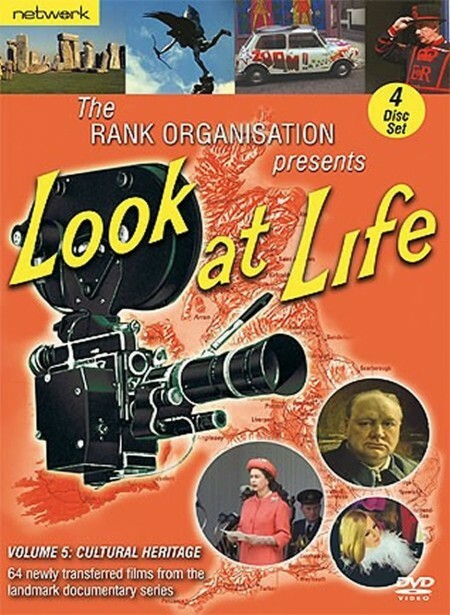 This regular series of short documentary films was produced in the 1960s by the Special Features Division of the Rank Organisation to screen in their Odeon and Gaumont cinemas - replacing the circuit’s Universal News, now rendered largely irrelevant with the advent of television news broadcasts. Marvellously concise and beautifully shot, these colour featurettes, numbering over 500 in total, presented cinemagoers with varied aspects of modern British life. Newly transferred from the original film elements, this volume presents 64 films encompassing Britain’s cultural heritage in all its forms and documenting a fascinating era of change - from the rebuilding of post-War Coventry to the traditions of the student rag, from the country’s still-flourishing tradition of brass bands to its contemporary art scene. A film looking at London from a dog’s point of view. A leisurely journey through London along the Thames. A film that examines the cult world of the coffee bar and its habits. A film for everyone who loves a garden, for everyone who loves a gadget, and for those who have never had the chance to see the Chelsea Flower Show in all its glory. A look at a typical London family on their annual hop-picking holiday. Fair Isle, famous for its distinctive woollens, faces a problem: more than two thirds of its inhabitants are men. But the island is still a very happy place to live. A look at a new generation in the City of London, from the crane drivers helping rebuild it to the flat-dwellers overlooking this throbbing heart of commerce. A film that documents the first steps in the rebuilding of Coventry after the devastation of the Second World War. A film showing London’s main markets at their busiest time and capturing all the energy and bustle of the three old markets, the market men and their generations-old traditions. A look at some of the ‘New Towns’ being built around the country. A film that looks at contemporary fairs, and explores their popularity. From small hand-bells to the great bell of Westminster, this is a film full of music, bringing into focus the fascination of an ancient craft. A look at the changes being made at Hyde Park Corner, in particular the Underpass. This film puts the spotlight on the human and mechanical components that make up the brass band - from a flourishing junior band in Wiltshire to the world-famous Black Dyke Mills band in Yorkshire. Author and broadcaster Stephen Potter shows why no man should ever underestimate the spending power - and influence - of women in modern Britain. A look at the contemporary British art world, and the increasing interest in all its aspects. An account of the ten-yearly census - the first record in colour of the entire operation. A look at various sights, including the Manchester Whitweek walks, liners, pet-shop windows, and holes! An exploration of English folk dancing, including the Hobby Horse Dance and the Furry Dance. The story of the Ordnance Survey and the maps it has been producing for over two centuries, told in fascinating detail. Over ten years, Lancashire saw a new industrial revolution; from 1950, more than 55 cotton mills were converted for light industries. This film examines the process of change for Lancashire’s workers. A film capturing the appeal of the four hundred castles, halls and mansions in Britain that are now open to the public. Behind every full state ceremonial is the Earl Marshal of England. And behind the Earl Marshal is the College of Arms. This film documents its fascinating, little-known work. A look at the work of the Forestry Commission. A look at the office of Mayor in Britain, and the Lord Mayor’s Show in London. Beneath our feet is a little-seen world; this film reveals the labyrinth of London’s sewers, an Aladdin’s cave of silver, and the GPO’s unique tube railway. A film capturing the 800 years of pageantry and ceremonial that attends the induction of a new Lord Mayor of London. A fascinating look at the lighthouses and light-ships around Britain’s coast. A look at the cities that are constructed for the world of cinema, featuring trips to Pinewood and Shepperton. A look at seven new universities at the time of the biggest expansion in the history of university training in Britain. Look at Life explores the world of students’ rags in Manchester, Hull, Sheffield and Leeds. Taking a look at the British country market, and the problems it is facing. Schoolchildren in Britain learn by going to see things for themselves, not simply by classroom instruction. Foreign trips, geography from the air and visits to historical sites all play their part. The Look at Life cameras visit the outdoor festival at Cleethorpes to see 12 top jazz bands. The island of Skomer off the Pembrokeshire coast is one of Britain’s many wildlife havens. This film details the work of warder David Saunders and his family. The holiday camp is a social phenomenon that has spread far beyond the British Isles. Look at Life explores the range of amenities on offer. Against the background of the Swinging Blue Jeans, this film looks at how the Merseybeat groups revolutionised pop music in Britain and beyond. A report on the National Trust and what it is doing to save our national heritage. A film detailing the change-over from the Imperial to the Metric system of weights and measures. A look at the world of one of our most venerable institutions: the seaside landlady. A film that tells the story of Britain’s nursery schools. A look at a typical Sunday in England - and the changes that are taking place. An intriguing look at the many and varied types of British exports. Boys’ clubs have served Britain for more than a hundred years. Rich men helped establish them; today they are state-aided. This film looks at their history and speculates on their future. A visit to London’s Clubland - from the smoky rooms of Soho, to the traditional clubs in St James’s. Portsmouth is no longer the sea-faring city it once was; this film looks at its changing face. Just how safe are Britain’s beaches? From the swimmer’s - and non-swimmer’s - angle, not safe enough; nor are the inland waterways, in which so many tragedies occur. In the Middle Ages, merchants and craftsmen of the City of London formed guilds and companies, many of which still exist. But what role do they play in the modern world? A look at the crisis facing Britain’s cathedrals, with massive repairs demanding the investment of vast sums of money. A fascinating look at the network of Post Office towers in some of Britain’s major cities. A look at the recording on tape of Welsh and Irish folk songs and stories. Westminster Abbey is not only a treasure house and tourist attraction - it’s also a business run by a community who, like the monks of old, spend their lives in its precincts. A look at the Ministry of Public Building and Works and its status as one of the biggest patrons of the arts in Britain. From one of England’s greatest stately homes to a grave in a little Oxfordshire churchyard, this film makes a journey that has become known as the Churchill Pilgrimage. This film shows what is happening in the Cinque Ports. Only one of the seven - Dover - remains a port; shingle brought in by the tides has silted up the coastline of the other six towns. A look at high fashion in Sixties Britain, exploring the exuberant styles on offer in the boutiques of our cities, and their colourful clientele. An intriguing look at the three-fold job of the British Museum, which also probes the reasons why so many of its treasures remain hidden. A film about Piccadilly, made as the area is about to be dramatically redeveloped to make way for modern precincts and a traffic underpass. A behind-the-scenes look at the work that goes on in the Tower of London. A trip to Kew Gardens and also to Syon Park, on the opposite side of the river. A look at the peerages, knighthoods and memberships of the various grades of the Orders of Chivalry rewarded to men and women who have deserved well of their country.